Kawasaki Japan officially launched the motorcycle latest Ninja ZX-10R. Glance looks brand-new 1,000 cc motor it seemed more muted than the old version. But Kawasaki claims the performance is much more fierce. As reported Cycleworld page, Friday (09/10/2015), motorcycle Kawasaki Ninja ZX-10R latest looks more rounded, different from the previous version are more pointed. But Kawasaki claims the design is intentionally made to maximize aerodynamics. 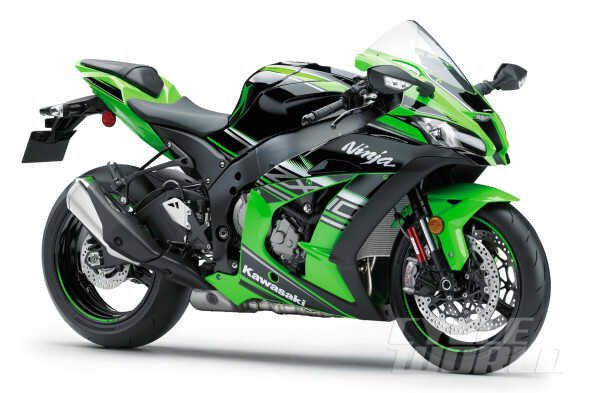 Feel new form less aggressive ZX-10R, Kawasaki outsmart by attaching the new black striping. Portions on the fairing is quite dominant and almost offset the portion of green color typical of Kawasaki. The good news, prospective rivals Yamaha R1 World Superbike (WSBK) in 2016 it now has a weight of five kilograms lighter. It was thanks to an aluminum twin spar chassis pinned new lighter, slimmer titanium exhaust valves as well as electronic throttle latest models. For machinery, sister Kawasaki Ninja H2 was still using the machine lawasnya, namely 998 cc DOHC four-cylinder liquid-cooled. Nevertheless energy has been increased to 207 hp with a peak torque of 113.5 Nm. Just like the MotoGP bike, the latest ZX-10R has also been equipped with features quickshifter. Its function is to lower the gear without having to pull the clutch lever. The new bike is also equipped ECU racing specifications, launch control system 3-way and technology Sport-Kawasaki Traction Control (S-KTC). To compensate for the engine performance, Kawasaki pinned new brake discs measuring 330 mm with M50 monoblock calipers. While in the convenience sector, manufacturers are often referred to as "green gang" were entrusted to the front suspension Show Balance Free and rear suspension Showa monoshock BFRC Lite. Not to forget, electric steering damper from Öhlins also pinned. If nothing changes, 2016 motorcycle Kawasaki Ninja ZX-10R is the latest to be sold from USD14.999 to USD16.299 or about Rp202,6 million to Rp220,2 million. The price confirmed soared to 400 million after the bike into Indonesia.